After a great start to my break with a field trip to Melbourne, I came back to Sydney to celebrate the Jewish New Year, Rosh Hashanah, and then it was off to Cairns for the real spring break! Cairns was truly paradise and by far one of the best vacations I have ever been on. We started our trip by booking flights, apartment accommodations and a day out on the Great Barrier Reef with Student Flights, an agency here in Sydney. Our break coincided with the local school holiday, making it prime travel season, making ticket-hunting much harder for us. Originally we were fine with the agent booking a hostel for us, but then she was able to find a two-bedroom apartment for five of us to split that worked out perfectly. Having everything set up for us made the trip a lot less stressful and made it easier for us to focus on the rest of our time in Cairns and plan other activities. 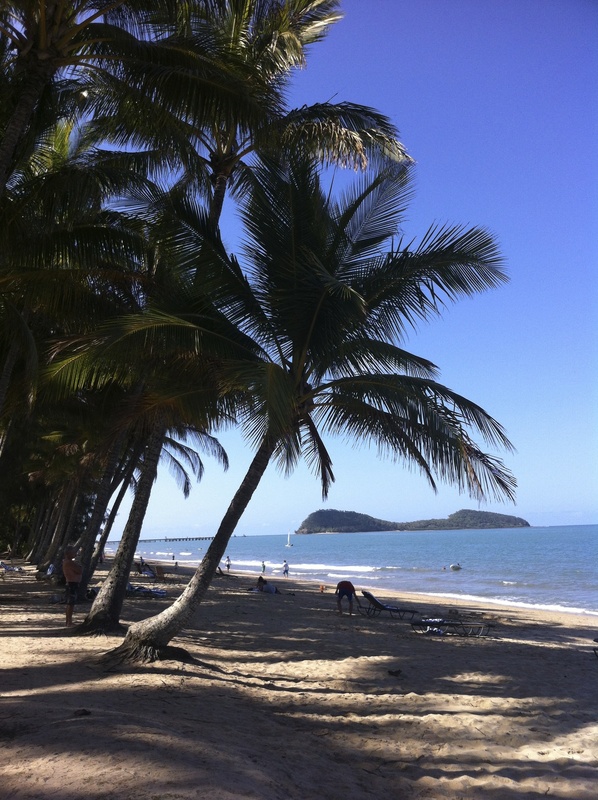 When we first arrived in Cairns on Friday morning we couldn’t check into our accommodations until 2 p.m. Perfect excuse to spend the day at the beach! We took a bus up to Palm Cove, about a 30-minute ride north of the city. And that was my first sight of paradise — palm trees everywhere, mountains in the distance and beautiful, clear blue water. What else could you ask for on a vacation? On Saturday, a friend and I spent the day at the Cairns Tropical Zoo. It was my first time seeing any koalas or kangaroos in person. Best was when I was able to hold a koala — and what a soft and cuddly creature she was! We also saw lemurs from Madagascar, crocodiles, rainbow lorikeets and wombats. Then came the day we were all waiting for: a day on the Reef! We took a two our boat out to the middle of the Great Barrier Reef for some snorkeling, scuba diving and relaxation in the sun. Unfortunately, I couldn’t go scuba diving because of my asthma. Although I probably would have been fine, the instructors explained that if I were to have an asthma attack while deep down in the ocean, they would not be able to bring me back up in time. Because of the dry air conditions down in the ocean and the risk of hyperventilating while trying to get used to the breathing underwater, it was not a risk I was prepared to take. I still had an awesome time snorkeling, and got so close to the coral that I was standing on it. I saw rainbow fish, an anemone–Nemo’s home–and even got to hold a sea cucumber. It was an absolutely beautiful day out at sea and I still feel so lucky that I got to experience it all. If there is one place to visit when you come coming to Australia, it is by far the Great Barrier Reef. It is truly a once in a lifetime experience. On our last full day in paradise, we took a guided tour through the rainforest and the tropical Atherton Tableland near the village of Yungaburra. To my surprise, my friend Joe, a BU grad who I worked with on FYSOP, is working in Yungaburra! We got to hang out one night in Cairns as the program he was working for was visiting for the weekend. Our first stop on the winding path up the mountains was at the Cathedral Fig Tree. The massive tree starts with a seed high up on a branch in the canopy of the forest. The long roots then make their way to the ground, creating cable-like paths all the way down. Our next stops were to Lake Barrine and Lake Eacham, where we saw turtles and some daring tour members jumped from trees into one of the lakes. My favorite stop of the day was Millaa Millaa Falls, a gorgeous waterfall in the middle of the forest. I could have stayed there all day lying behind the falls watching the water rush down. It was a packed day, making more stops at a crater, Dinner Falls, and leaving time to go platypus watching. Nothing could have made this trip better than the friends, laughs, sunshine and beauty that encompassed our vacation to Cairns. It will be a trip I’ll never forget, and I am continually reminded of how lucky I am to be here in Australia with the support of my family and friends on this amazing adventure.